How ironic that the world’s greatest and largest digital broadcaster, YouTube, has decided to use “analogue” promotion for its “Fan Fest” here in Sydney. Search online and you will find almost nothing other than this page and a “waitlist” holding page on Ticketek. Remember YouTube claims the following statistics. With more than one billion users, every day people are watching hundreds of millions of hours and generating billions of views: up 50% year on year. Some 300 hours of video are uploaded to YouTube every minute. That’s correct, every minute. Put that in perspective: that’s 432,000 hours of NEW video every day. No one can watch even a minor fraction of that, and mega-computers are needed just to keep track of it all. 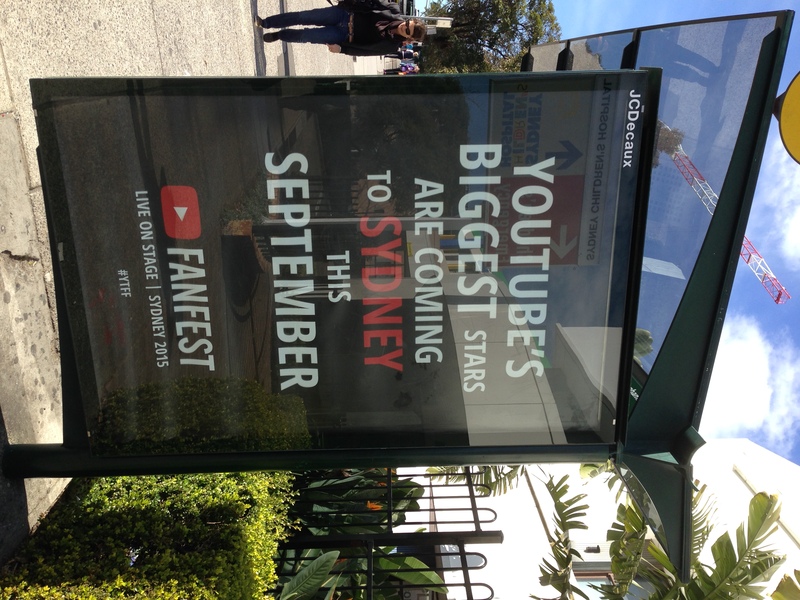 With all of that digital reach and power, how come YouTube has decided to blanket Sydney bus stops with its Fan Fest posters, such as the one in Randwick (on High Street, outside of the Prince of Wales Hospital) below? It does say something about the power of the “tangible”, and the limitations of digital advertising and social media in promotion, when YouTube (and its parent company, the all-powerful Google) has decided to utilise “outdoor advertising”. The Outdoor Advertising Association of America traces the earliest advertising to ancient Egyptian times. The modern billboard industry is widely accepted to have its start in the mid-1860s, with 1870 marking the beginning of modern outdoor advertising. Food for thought in our digitally disruptive times. Here’s more proof that despite the digital world appearing to be sitting solely in cyberspace, geography matters for digital businesses – perhaps even more than ever. One of the ironies of the tech economy, duly noted by Schmidt and Rosenberg, is that while the products and the users are geographically untethered, the businesses that supply them are increasingly clustered in one physical location, Silicon Valley. That’s because of the unusual, and apparently non-replicable, infrastructure of support there: the Stanford engineering school, the Sand Hill Road venture-capital firms, the angel investors, the talent pool of coders and engineers, the technical-infrastructure providers. Did you get that phrase – “increasingly clustered”? So much for the work from anywhere, do all work from home concept. People still need – and indeed want – to be physically proximate to each other. The reference to “Schmidt and Rosenberg” above comes from the book How Google Works, by Eric Schmidt (former Google CEO) and Jonathan Rosenberg (former Head of Product Development). Has the “Digital Tipping Point” arrived? Yes, says Deloitte Australia: the “digital tipping point” has definitely arrived, with permanent and irrevocable changes to our information and entertainment consumption. – Using the Internet is likely to eclipse watching TV as the preferred source of entertainment within a matter of months. – We have gone “tablet mad” across all age groups – more than half (53%) of Australian survey respondents are now ‘digital omnivores’ – owners of a tablet, laptop and smart-phone, up significantly from 28% last year. – Smartphone ownership is at 81%, an increase of 21% over the last three years. – When we watch hit TV shows, we “binge”: some 72% of their survey participants watch back-to-back episodes (three or more) in one sitting – and more than a quarter of us (26%) are doing this once a week. Compared with other surveyed countries, Australia has the lowest newspaper subscription rates per household, whether print or digital (22%), compared with the top ranking Japan (53%), the UK (51%) and China (44%). An additional 8% have digital-only subscriptions. Within the surveyed population, newspaper subscriptions have declined by 5% over the past three years while digital-only subscriptions have grown by 26%, albeit from a very low base. We love our printed mags – the printed magazine is still holding its own and remains the preferred way to read magazine content (49% of all survey respondents). Nearly half (49%) of magazine subscribers indicated that if the price of their favourite magazine was the same for various options of physical or digital copies, they would prefer to receive the physical copy only, rather than both. And here’s a cool infographic that summarises the key findings. Overstating the facts? Probably, as it’s not likely that their survey reached many of the bottom 20 percent of Australians, who experience “digital exclusion”. But the trends are apparent. Still not convinced that the digital has changed our communication forever? A recent Time magazine article by Katy Steinmetz (August 4, 2014 here in Australia, published a week earlier in North America), notes, “The total number of words in all text messages sent every three months exceeds the word count of all books ever published, according to text-analytics firm Idibon”, which is a genuinely “new age” company that is based – where else – in San Francisco. Some 48 hours after watching the film “her” in the cinema, I am still haunted by its stylish and uncommon beauty, and its sly, understated but yet biting theme of emotional disconnection in the digital age. Under its off-kilter romantic dramatic exterior lurks a science fiction film that raises deep questions about our present fascination with personal technology “solutions” and how this will change the nature of human interaction in the near future. Have you ever sat with a group of people, and realised that everyone was staring into a small screen, silently swiping or typing or reading or listening through earphones? This is the future that “her” posits, although with a difference. Living in a higher density Los Angeles that looks uncommonly like China (the exteriors were all shot in Shanghai; will the China of today irrevocably become the future of tomorrow?). Our main character Theodore Twombly (Joaquin Phoenix) ironically writes letters for a living – yes, real letters for real people who are unable to express themselves emotionally. Everyone in “her” lives in a frictionless world, talking into their ear pieces, with a bland, pale set of colours, sort of “Apple-lite” (seen any Apple advertisements recently?). Nobody is physically injured in “her” (although Theodore does trip, once); everyone seems to glide through a world that has been made so safe through technology that personal feelings are shielded. The result? Our closest relationships are those with the “operating systems” of our computers. Jonze is a genuinely gifted director. Following his collaborations with Charlie Kaufman (writer of Jonze’s uber-trippy films “Being John Malkovich” and “Adaptation”), he has come into his own writing this one. One of the beauties of “her” is that the film truly has the courage of its convictions: yes, what would genuinely happen if (when?) artificial intelligence becomes so sophisticated that they become our best friend. When my friend recently swore at Siri, the iPhone’s voice intelligent system, Siri admonished her. Really, how close are we already to Jonze’s world? Even the name Twombly – Anglo-Saxon and yet unusual – is highly evocative. The most recognisable person with that last name is the painter and artist “Cy” (Edwin Parker) Twombly (1928-2001), whose works were inspired by “ancient Mediterranean history and geography, Greek and Roman mythology and epic poetry”, resulting in sometimes “inscrutable” works that include “iconography, metaphor and myth”. As Christy Harrison has pointed out, “the film’s colour scheme often seems to be directly lifted” off the artist’s canvas (see her post for two screenshot/painting comparisons). Danny Bowes notes that Phoenix’s character even dresses like the artist. If you live in Sydney, as I do, you will have to rush if you wish to catch “her” in the cinema – and this is a cinema film, that a widescreen experience greatly enhances, bringing you into its odd and ever so slightly bizarre world. We watched it at the Macquarie Centre, in an afternoon weekend screening that was the only one that day. “her” has been nominated for a number of Academy Awards: best picture, best original screenplay, best original score, original song and production design. In a different year – one without the flashy, louder nominated films (you know who you are) – “her” could have featured more highly in both the nominations and the actual winners. But that’s the way it goes in the near future. You are currently browsing the archives for the Digital world category.